This book will help veterinary students find vital information fast, when every second counts. The Small Animal Veterinary Nerdbook has become the profession’s gold standard for finding the information needed for everyday clinical practice when and where needed. 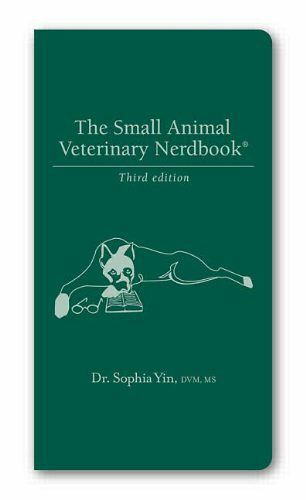 In fact, more than 30,000 copies have been sold to veterinarians and veterinary students. This pocket-sized reference gives immediate access to accurate, practical information on 21 subjects, with handy headers, as well as sleek tables and charts. The Nerdbook places special emphasis on topics critical to the practice of routine clinical medicine, such as cardiology, toxicology, nutrition, critical care, infectious disease and dermatology. Charts, tables, diagrams, and outlines make skimming the information simple. It’s ideal for clinical use and for board-exam review. • The anesthesia section contains an illustrated instruction on nerve blocks and more on anesthetic monitoring. • The parasitology section summarizes the most updated CDC and CAPC recommendations and heartworm society recommendations. • The infectious disease section explains how to set up vaccine protocols. • A urinary section that follows the international Renal Interests Society staging system. • The GI section features a clinical diagnostic approach to diseases. In its third edition with loads of new and updated information, the Nerdbook is better organized, easier to understand and more clinically relevant than ever before.